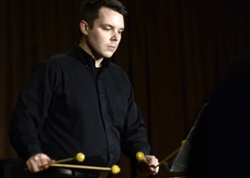 Dr. Christopher Butler is currently a Lecturer in Percussion at Southern Illinois University at Carbondale. Dr. Butler proudly endorses Innovative Percussion and Marimba One. Dr. Butler completed his doctorate in percussion performance at the University of Kentucky in 2016 under the advisement of Prof. James Campbell. He earned his BM in Percussion Performance from Columbus State University where he studied with Dr. Paul Vaillancourt. He then completed his MM in Percussion Performance from the University of Illinois at Urbana-Champaign while studying with Prof. William Moersch and Prof. Ricardo Flores. While attending UIUC, Dr. Butler was the recipient of the prestigious Swanson Family Percussion Fellowship and Presser Graduate Music Award. Dr. Butler has performed with a variety of professional ensembles including the Lexington Philharmonic, Orchestra Iowa, Sinfonia da Camera, Champaign-Urbana Symphony Orchestra, and LaGrange Symphony Orchestra. In addition, Dr. Butler has also studied non-western music with Bolokada Conde (African drumming) and I Ketut Gede Asnawa (Balinese gamelan). He has also participated in clinics with Brad Dutz, Chris Wabich, River Guerguerian and Michael Spiro. In 2016, Dr. Butler co-founded the BlueSHIFT percussion quartet alongside Matthew Geiger, Jeremy Maytum, and Francisco Perez. Dedicated to the performance of new works for chamber percussion, BlueSHIFT has performed throughout Kentucky and Illinois, most notably at the Outside the Box music festival in Carbondale. At Southern Illinois University at Carbondale, Dr. Butler teaches graduate and undergraduate percussionists in applied lessons and other percussion courses such as percussion pedagogy and percussion literature. In addition, Dr. Butler oversees and directs the SIU Percussion Ensemble, a premier chamber ensemble within the School of Music. He also works closely with non-percussion majors including aspiring music educators within Percussion Techniques and non-music majors playing within the Marching Saluki drumline. In 2016, Dr. Butler also began teaching Computers & Music, an important music technology class for all SIU music business majors. Within the Southern Illinois region, Dr. Butler leads the SIU percussion studio in performing community outreach through events such as the SIU Percussion Night, a monthly masterclass offered to enthusiastic young percussionists, and the Heartland Youth Percussion Ensemble (HYPE), a chamber ensemble comprised of the most talented and bright high school percussionists in the region. In 2015, Dr. Butler organized the inaugural SIU Day of Percussion, an event which featured guest artists James Campbell (University of Kentucky), William James (STL Symphony), and Gavin Ryan (Utah). Dr. Butler's current research is primarily focused on the theory of rhythm and meter in works for percussion, specifically in the music of Alejandro Viñao. In 2016, he completed his dissertation titled "Understanding the Percussion Works of Alejandro Viñao: An Analysis and Performer's Guide of WATER for Percussion Ensemble."